ISO 527-2 is an international standard for determining the tensile properties of reinforced and non-reinforced plastics. While it provides similar results to ASTM D638, ISO 527-2 is not considered technically equivalent due to differences in specimen size and test requirements. While some large multinational manufacturers test to both ASTM D638 and ISO 527-2, most of our customers demonstrate a preference for one standard or the other based on their geographical location. North American manufacturers usually test to ASTM D638 while those in Europe and Asia primarily test to ISO 527-2. Customers in China test equally to ASTM D638 and to ISO 527-2. This guide is designed to introduce you to the basic elements of an ISO 527-2 plastic tensile test, but should not be considered an adequate substitute for reading the full standard. ISO 527-2 is performed on a universal testing machine by applying a tensile force to a sample (specimen) and measuring various properties of the specimen material under stress. The test is conducted at tensile rates ranging from 1 to 500 mm/min until the specimen fails (yields or breaks). What Does ISO 527-2 Measure? Tensile strength – the amount of force that can be applied to a material before it yields (stretches irreparably) or breaks. Tensile modulus – how much a material can deform (stretch) in response to stress before it yields. Modulus is a measurement of the material’s stiffness. Elongation – the increase in gauge length after break divided by the original gauge length. Greater elongation indicates higher ductility. Poisson’s Ratio - a measurement of the relationship between how far a material is stretched and how thin it gets during the stretching process. Is ISO 527-2 the Right Standard for You? There are many different test methods for various types of plastics. ISO 527-2 is intended for testing rigid and semi-rigid plastics, whether molded, extruded, machined, or cast. ISO 527-2 also applies to reinforced plastics (with the exception of fiber-reinforced plastics, which are covered under ISO 527-4 and ISO 527-5). When testing films and sheets less than 1 mm in thickness, ISO 527-3 should be used. These methods and others can be found in Bluehill® Universal's Applications Modules, which contain pre-configured method templates for the most commonly used ISO and ASTM standards. 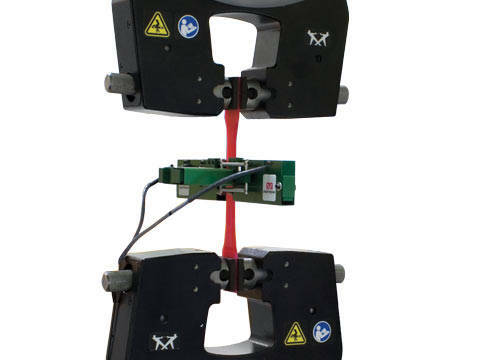 Most ISO 527-2 testing is performed on a table top universal testing machine. A 5kN or 10kN (1125 or 2250 lbf) system is most common, but as reinforced plastics and composites increase in strength, higher capacity units such as 30 or 50 kN systems may be required. Instron offers two series of Universal Testing Machine frames, grips, load cells, and extensometers which meet the accuracy requirements in ISO 527-2. However, those of our customers with high-volume testing needs, global operations, and advanced research applications typically prefer the 5900 Series systems with 2712 pneumatic grips, which provide additional benefits to accuracy specifications and efficiency enhancements. Because the testing process subjects specimens to intense forces, it is important that the specimens be held securely inside of the test machine. Side-action pneumatic grips with serrated jaw faces are often the best grips for holding rigid plastics. Pneumatic grips maintain their gripping force with air pressure, which remains constant even if the specimen deforms during testing and its thickness changes significantly. For forces above 10 kN, typically only found with reinforced materials, manual wedge-action grips are preferred. Extensometers are used to gather modulus data, which is one of the most important properties evaluated in ISO 527-2. Modulus of elasticity is the measurement of how much a material stretches or deforms in response to tensile force. Extensometers for measuring modulus must comply with ISO 9513 Class 1 with 1% accuracy, and several options are available depending on the needs of your laboratory. The simplest type is a fixed-gauge length 2630 series clip-on extensometer, which must be clipped directly onto the specimen at the beginning of each test and removed after the specimen yields or before the specimen breaks. If testing for Poisson’s ratio, a transverse extensometer must also be added to measure the change in width throughout the elastic region of the specimen. A standalone transverse extensometer can be used to supplement an existing clip-on or automatic extensometer, or a biaxial device can be used to measure both axial and transverse strain simultaneously. In labs with high throughput needs, automatic extensometers can help eliminate the time-consuming need for manual manipulation by the operator, and also provide more consistent placement on a large number of specimens, increasing repeatability values. The AutoX750 automatically attaches to the specimen without interference by the test operator. The Advanced Video Extensometer (AVE 2) is a non-contacting extensometer which uses a camera to track deformation of the specimen throughout the test. If testing to other standards, such as ASTM D638 or ISO 178, automatic extensometers also provide the flexibility of using different gauge lengths with a single device. There are six possible specimen sizes for testing to ISO 527-2. The preferred specimens are dumbbell-shaped specimens types 1A (injection molded) and 1B (machined). While there are differences in length between these two specimen types, they share a nominal width of 10 mm and thickness of 4 mm. The preferred gauge length for Type 1A specimens is 75 mm, which is a change to the standard introduced in 2012. Until 2012, the preferred gauge length for type 1A was 50 mm, which is still acceptable for quality control testing or where specified. In instances where material is limited, many labs will use sub-sized specimens of types 1BA, 1BB, 5A, or 5B. In these cases it may be technically difficult to measure modulus because of small gauge lengths and short testing times. Results obtained from small specimens are not comparable with those obtained from type 1 specimens. All specimens must be measured before testing in accordance with ISO 16012 or ISO 23529. Most typical micrometers should be suitable for performing these measurements. In order for the test system to display Stress measurements rather than just Force measurements, operators will be asked to input the cross-sectional area (thickness and width) of the specimen, because Stress = Force / Cross-Sectional Area (this is shown in units of Psi, Pa, kPa, GPa, etc). While the thickness and width of rigid specimens require different measurement accuracies, it is common to use the same measuring device for both. Either cylindrical or rectangular tips can be used, assuming they meet the dimensional requirements provided by ISO 16012. Injection molded specimens are often produced with a draft angle instead of being perfectly square, so care must be taken to measure width at the center of the draft angle. In order to obtain proper results, specimens must be correctly aligned inside the grips. One way of preventing misalignment is by using a jaw face that is close to the same width as the specimen, making it easier to visually adjust the alignment. The simplest way to prevent misalignment is to use a specimen alignment device which mounts directly onto the grip bodies. Once the grips tighten onto a specimen, unwanted compressive forces are usually applied. These forces, although minute, can interfere with test results if not treated properly: It is important that they not be balanced after the specimen is inserted, as this will cause an offset in results. Bluehill Universal software can be programmed to normalize forces across multiple specimens and remove any slack or compressive force, ensuring consistent results between specimens. On the 5900 Series universal testing machines we also recommend the use of Specimen Protect, which is designed to prevent damage to the specimen or system during the setup phase of a test, before a test’s operational limits are defined. When turned on, Specimen Protect automatically adjusts the crosshead to keep any unwanted forces under a certain limit. When presenting test results, it is important to ensure that the terms are properly defined in order to comply with the ISO standard and facilitate data comparison between different laboratories. The most common mistake in data reporting is the reporting of strain values using an incorrect source. For plastics, percent elongation at break often cannot be measured exclusively by an extensometer because plastic does not break down homogenously and strain is often focused on a disproportionately small part of the sample, a property known as "necking." Because necking may occur outside of the extensometer's gauge length, a term called "nominal strain" must be used to report percent elongation at any points after yield. Using an extensometer for strain at break is only acceptable if the strain is homogenous throughout the specimen and does not exhibit necking or yield. Nominal strain is defined differently depending on which test method is being used. For ISO 527-2, nominal strain can be measured in two different ways: Method A measures nominal strain purely by crosshead displacement, but for multipurpose specimens, Method B is preferred. Method B measures nominal strain as the strain measured from the extensometer until yield and and from crosshead displacement after yield, which ensures that necking behavior outside of the extensometer gauge length is taken into account. ISO 527-2 defines modulus as the slope of the curve between 0.05% and 0.25% strain using either a chord or a linear regression slope calculation. Because the modulus calculation starts at 0.05% strain, it is extremely important that appropriate pre-stresses are applied to the material to remove any slack or compressive forces induced from gripping the specimen. It shall not exceed 0.05% strain or 1% of the tensile strength of the material. In the 2012 update to the standard, a change was made to the definition of tensile strength. In previous versions, tensile strength was defined as the maximum stress at any time throughout the test. In the latest version of ISO 527-2, tensile strength is taken at the first local maximum exhibited. This change is particularly critical for customers testing materials which have yield points such as polypropylene, polyethylene, and nylons. For labs with high-volume testing needs, several modifications to the tensile machine setup can be made to speed up the testing process and increase throughput, up to and including fully automated test systems. Fully automated systems are designed to incorporate specimen measurement, specimen loading, testing, and removal, and are able to run for hours without operator interaction. These systems help to reduce variability due to human error and can be left running after a shift ends to continue getting results when operators go home. ASTM D638-14 specifies a method to determine the tensile properties of reinforced and unreinforced plastics, including dumbbell, rods, and tubular specimens. To achieve accuracy and repeatability with Poisson's Ratio of plastics, measure the transverse and axial strain with biaxial extensometers.